The first ever Bridal Bash KC was an absolutely awesome experience! Bridal Bash is a totally unique wedding show that travels between 3 different venues with 3 different vendor teams. 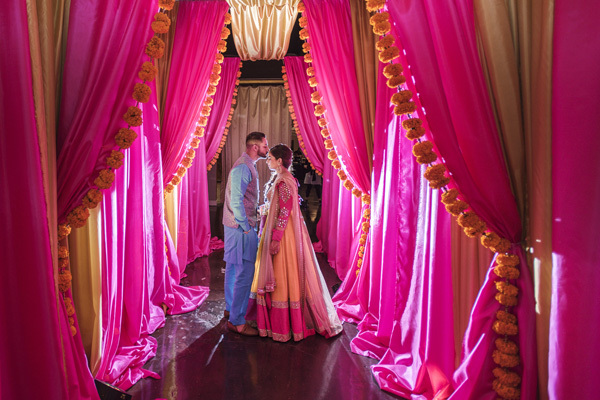 At each venue is a completely different decor theme, where the attendees get to experience what an actual wedding and reception would be like there through a real vow renewal. We had the privilege of being the exclusive rental decor company for all 3 venues, which meant lots of really fun work. It was a months long process of coordinating with each team about the desired look and feel at each venue. We will be recapping the decor at each venue in separate blog posts all this week! This first recap is the Modern Geometric theme at the Brass on Baltimore! We love working at the Brass on Baltimore, they have several different event spaces, and all very beautiful. Their crown jewel is the newly added modern space on the 15th floor. It is light and airy and has gorgeous sumptuous touches, particularly that bar! We went with the modern geometric theme, because the 15th floor space at the Brass on Baltimore is such a clean, white slate (…and I wanted to make a copper geometric hanging installation for over the head table, truth be told). 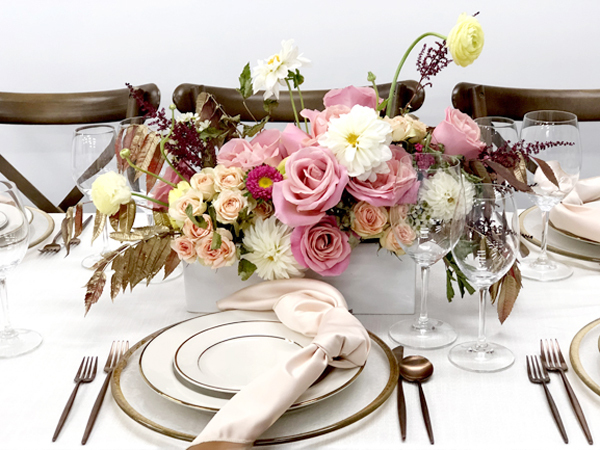 We used mixed metals, with copper and gold, and one of my current favorite tablecloth colors – lagoon! The couple having the vow renewal was so sweet and looked to have an absolute blast! They had several friends and family attend as well, and their children served as their bridesmaid and groomsman. We custom made the watercolor backdrop to fit in with the rest of the theme. 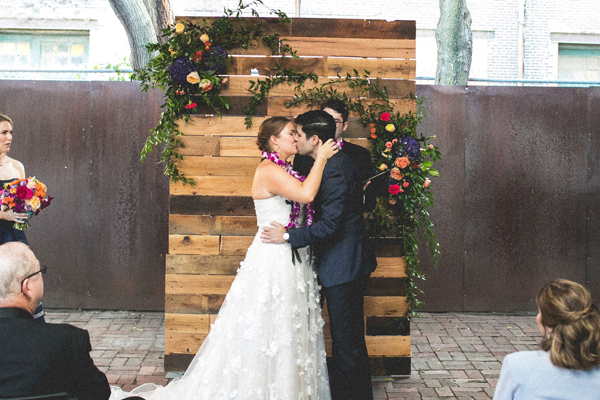 OMG, check out that bouquet by Wild Hill Flowers! My love – the custom copper geometric installation we made just for this event, and Wild Hill Flowers adorned it with greenery. 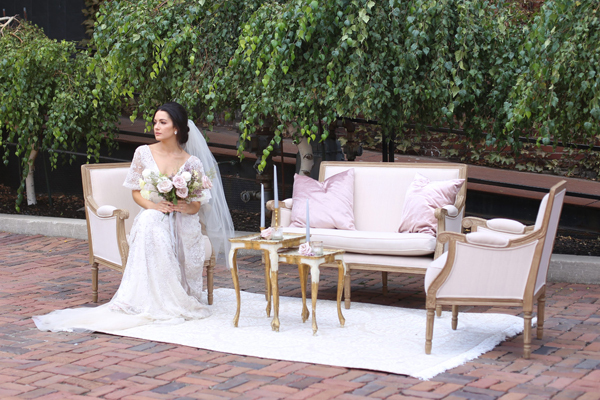 This entry was written by carolynpom, posted on at 3:06 pm, filed under BLOG and tagged adorn cakes, brass on baltimore, bridal bash kc, copper and gold, events by nellie, jukeboxx media, melissa sigler photography, modern geometric wedding, olive events, wild hill flowers. Bookmark the permalink. Follow any comments here with the RSS feed for this post. Post a comment or leave a trackback: Trackback URL. « Previous Post: Gorgeous Mildale Farm Wedding on the Knot!